“We do,” I quickly confirmed Lenny’s self-assessment. “So, human pontoons?” I tried to visualize Bucky on my left, Lenny on my right, and me jammed in the middle in some totally weird, potentially embarrassing adolescent male jumble of wet flesh, them holding me up above the waterline, me wishing I’d stayed in bed, or at least written my last will and testament to my stupidity. “Is she here?” I asked. “Everyone else is wearing rubbers,” Lenny piped in. “It looks frigid,” I said, beginning to imagine a slow death by pneumonia instead of a quick deise by drowning. I donned my scuba gear and slipped over the side of the dive boat to join my friends photographing the wreck. I could not find them. Instead, I came across some other wrecks. Realizing these wrecks were the missing planes and ships that disappeared in the Bermuda Triangle, I knew I would make a fortune off these photos, and be able to live here forever. Excitedly I snapped images of as many wrecks as possible. Feeling light-headed with waves of nausea racing through my body, I became disoriented and lost track of time and direction. Surfacing in front of an island, I tore off my diving mask and gasping for air made for the sandy shore. As I came out of the surf another wave of nausea hit me; two divers helped me ashore. Relieved I thought I found my friends. I noticed that the beach was full of divers and they were all watching for me. Another wave of nausea hit me, and I passed out amongst them. Waking up, someone helped me up off the sand. Looking around, I discovered myself staring back at me. In fact, all the divers on this beach and coming out of the surf was me. We continued to rescue more of me from the ocean. Soon the beach, the sea, and my reality filled with me, myself, and I. Now all of us live happily in the middle of the Bermuda Triangle. Why not join us forever? Many called me crazy to sign up for the race, I could barely swim. The riffraff can’t understand the power of determination and incentive. Something had lit a fire in my engine and it was chance that signed my name on the paperwork. My short grey hair fit perfectly under the red rubber swim cap. 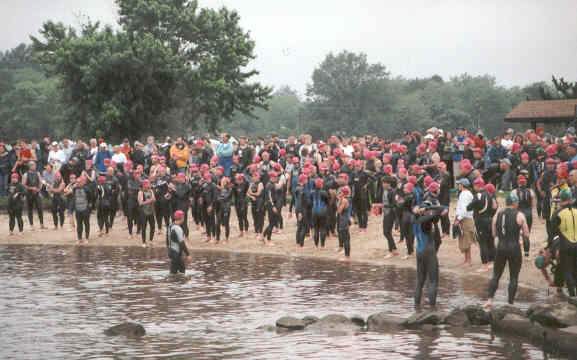 The black wet suit helped tremendously on my arthritic body and the sand on my bare feet felt like electricity that moved me along the conveyor belt of other entrants headed toward the water. “The promises better be true,” I told myself. Many had already entered the water but so far none had come back. I wasn’t worried. I had to keep my head and just focus on the swim. Kick the feet, arms at full extension one after the other and pull the water past the body. Head side to side, breath in breath out. Eyes too blurred by the water to see past the rotation of my arms but it seems to be getting easier. I am getting close because I can almost touch bottom. As I walk-swim out of water, the sand under my feet invigorates me and I notice all the other swimmers look as if they are getting younger… standing taller… moving without pain. I look at my hands, kick my legs, turn my head back towards the water and realize the other elders that swam with me are young again too! “Folks, folks! Can I have your attention please? “First, I would like to welcome you all to our first annual Summer Swim Event in the beautiful community of Adaptable. “As you know, the first contestant to cross Adaptable Lake will win a beautiful papier mache trophy made by Ms Pearson’s talented preschoolers at Pearson’s Preschool. Second and third place will win genuine chrysanthemum bouquets donated by Marigold’s Florist and Gifts. “Second, there has been a slight change in the program, due to circumstances beyond our control. “You will notice that I am standing in water up to my knees. Sorry to say, the water gets no deeper than this all the way across the lake. Now a lesser community might consider this an impossible hurdle and call off the contest . But not us. Not Adaptable City! We are Adaptable, and we have adapted! “We have decided that swimming is not required. Running is acceptable. And AND at the conclusion of the event, each and every participant will be provided with their very own glazed donut courtesy of Jane’s Donuts and Coffee. Coffee will also be available at three dollars a cup, not including the cup. “For your convenience, wet suits may be exchanged for running shoes or waders at Zimmer’s Sporting Goods, at no charge except for a nominal cleaning fee. When they released me from the underwater dressing room posing in my new imported French bikini, the pedestal I was posing on emerged in the middle of the pond. There they were. Hundreds of them. Screaming, yelling, whistling. I thought they were going to crash right through the few guards trying to hold them back. What a sight! I did some quick figuring and estimated there must be at least five-hundred drooling maniacal men and women waiting to see who held the winning ticket. At fifty-dollars a ticket – Holy smoke! – that would be at least twenty-five thousand dollars. I waved and wiggled at the rollicking horde. They lurched forward in a frenzy. Were they trying to get to me? Suddenly, the loudspeakers screeched out. “Ladies and Gentlemen, and you teenagers, too, we’re ready to announce the winner, so gather ‘round.” Some amazingly dressed blonde, almost as pretty as me, began singing “The Doggie in the Window” into her hand-held mike. A canoe pulled up alongside my pedestal and someone handed the winner’s package to me. The singer sang out the winning number. One voice in the crowd screamed “Yessss,” over the hundreds of frustrated moans. They took the yipping champion prized Blue Chihuahua in her gold plated carrier and presented it to the happy winner. I was so proud to be part of this event. All proceeds were being contributed for those poor unfortunate animals in ASPCA’S fight to end animal abuse. Pete Mallard was a nine-year-old boy who wanted to be a real-life detective. He and his gang went to the beach to watch Pete’s older brother, Patrick, compete in a swimming competition—The Big Swim. Pete and his friends had never seen so many swimmers. They all wore red swimming caps. Bare footprints covered the beach. Pete inspected the area. He found some unique shoeprints in the sand. They returned to the swimmers and studied each one closely. “There’s our suspect.” Bobby pointed to the only swimmer not wearing a red cap. “How did you know?” Bobby asked. The water sent shivers through my thighs, arms and then head. When I resurfaced the air felt warmer . I could see the blurred face of my friend Martin to my right, tentative to dive under. If only he had been as reluctant with my wife Maria. Swimming out through the breakers, I held back watching Martin’s kicks as we began crossing the channel. The waves grew choppy and higher. I looked back to the shore, now out of direct sight as we reached the middle of the channel. Swimmers had dispersed and were at least 50 yards away, mostly in front of us. I dove deep under the water. Accelerating under the waves I could see the red stripe of Martin’s suit. As I rose I removed the syringe from my pocket and plunged the paralyzing Stonefish venom into his thigh. He turned on his back and swatted at his leg. I resurfaced and he faced me. I swam close and held his head above water to look into his frightened eyes, his facial expression frozen and stiff. I thought of Maria and imagined her response as Martin slowly submerged. No one noticed as I pushed Martin down, his upward gaze frozen. I reached the shore and grabbed a towel, sinking my face into the warmth. I couldn’t stop shaking as I dried off. I felt a tap on my shoulder, “How was your swim?” asked a stranger. “Colder than I expected” I responded, through chattering teeth. Hundreds of us gather on the beach. This big swim is our only escape from prison. Not an impossible swim to the mainland, but a grueling swim around the island. All who can swim to the opposite side have been promised a pardon. At the signal we plunge through the gate and begin our trial. The fence, embedded in the sea floor, has kept us on this island and will prevent us from coming ashore too early. We will swim to freedom or die. The northern route is said to be shorter and calmer. But huge sharks patrol those waters. I will swim south and take my chances with jellyfish, sting rays, and crushing waves. Although I’ve been training and building strength for over a year, the swim proves exhausting. My wet suit is not as buoyant as I’d hoped. Swimmers flail as jellyfish sting their faces. Some disappear beneath the ever-pounding surf. Others try to cling to the fence, but the slick surface makes a handhold impossible. Sometimes I gulp salt water. Choking and spitting, I regain my composure and continue on. After an eternity of sea and sky, I see the final gate ahead. A few swimmers have already gone through and are walking onto shore. But then I see guards firing automatic weapons at these victorious swimmers. I recognize the true horror of this ordeal. The only escape from this prison is death. So I turn away from shore and begin swimming toward the open ocean. The crowd jostled one another trying to see the dozens of us contending in the morning’s race in the cold waters of the ocean. Could I possibly come in first for once in my life? While we were waiting for our turns in the swimming meet, I recalled the first time I ever saw the Pacific Ocean. I was about three years old, and we were on a cruise. I was amazed at the amount of water in that big swimming pool, a little like our pool in our back yard, the pool that was fenced and protected to keep animals and kids like me out. The amount of water seemed to go on forever until the sky picked out its spot in the distance. Amanda kneed me slightly to remind me she follows me. I do better when she is in front of me, but our names are drawn to put us wherever the number falls. It was now my turn to wade into the ocean to see if I can make the goal and back again in my time. The objective is to improve my time in the 5-meter race from last week’s time. I beat last week by five seconds, but try as I might I still came in second overall. Oh well, next week. Amanda can’t always be first.